Men’s work, warm season: ceremonies, warfare, ballgames, construction, fishing, land clearing for farms. Women’s work, warm season: cultivation, cooking, collecting firewood, curing skins. I was at the visitor’s center at Ocmulgee National Monument, a rich archaeological site just outside Macon, Georgia, viewing the history of the various Native American groups inhabiting this area during the past 10,000 years. The Mississippians were of special interest, a farming people who had built the highest-level culture that existed north of Mexico between 900 and 1100 A.D. A sedentary people, they grew corn, beans, squash, pumpkins and tobacco. The men were evidently skilled hunters — their lifestyle as outlined above seemed rather ideal for the men of the tribe. One of the remains of the Mississippian culture is a series of large mounds like those at Cahokia Mounds in Illinois near St. Louis. The Great Temple Mound in Ocmulgee is 42 feet high, with a 300-by-270-foot base and was built up in stages over time. In climbing to its top, I found it hard to imagine people without good shovels or wheelbarrows carrying the tons of dirt needed to create it. I have noted in my travels that humans tend to find things to put their excess energy into when food and shelter are readily available. With time on their hands, they find some task that they can assign great importance to. This appears to have been one of those tasks. Near the temple mound is a funeral mound that was constructed in seven stages and where more than 100 bodies have been uncovered. Again, I have noted that when we humans set up communities, some people are recognized as being special, and their deaths are assigned special recognition. 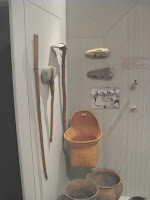 Often important items are buried with them, and some of the Mississippians’ grave artifacts are on display in the visitors’ center. Whatever our basic human propensities are, they seem to be demonstrated by what we see at Ocmulgee. A sign at the entrance to one of the mounds. Ceremonies also seem a natural outcome of humans settling in one place, and here they were centered in and around a 42-foot-diameter earth lodge. The tour brochure says it was probably a meeting place of the town’s political and religious leaders. Three seats are on a clay platform that is shaped like a big bird, and 47 seats are around the wall. The original lodge was destroyed by fire, which gave archeologists a firm basis for reconstructing it over the original clay floor that is estimated to be 1,000 years old. 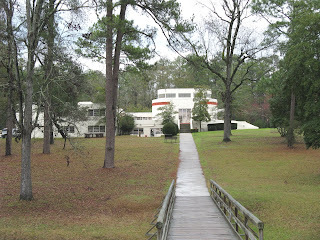 Little attention was paid to Ocmulgee as a historical site until 1934. Before that, a railroad had been built through the area, destroying some of the mounds, and collectors of Indian artifacts had been raiding mounds to uncover artifacts. The renovation was done with labor from the Works Projects Administration and the Civilian Conservation Corps. We owe a number of our national monuments to these Depression-era “make work” programs. It’s a significant legacy. The modern visitors’ center displays artifacts left by the Mississippians, such as decorated pottery, clay statues of humans and copper ornaments. Shell ornaments indicate that trade existed between these people and coastal tribes. At the center are also accounts of the other peoples who have inhabited the area, starting with the ice-age hunters who came to the New World about 10,000 years ago. A group called the Lamar lived along the Ocmulgee in the 1300s, and it was these people who were here when Hernando De Soto made his expedition into the region in 1540. The contact was really bad news for the Lamar, who were decimated by Spanish diseases. Creek Indians settled in the area for a while, but warfare between the British and the Spanish had driven them out by 1715. The visitor’s centers at National Parks and Monuments are often very distinctive and well designed. hjdghgadklasjçkjafnhlkjhjfkah jJHGSJHAGJJ DAUIHJGBN hewghdgs dghdgdsj.sajghhhdfj.